Somewhere around the third to fifth grades, I went through a phase of refusing to wear jeans. It started with some adorable purple and pink sweat suits I had with fluffy animal decals on the shirts and complementary piping down the legs of the pants. Yes, it’s OK to wear sweatpants in public when you are 8 years old. When you are 28, not so much. Then I moved on to some coral and beige elastic waistband cargo pants given to me by my impossibly cool older cousin Amy’s parents when she outgrew them. Twice a year a large box arrived in the mail for me full of was-cool-three-years-ago hand-me-downs. 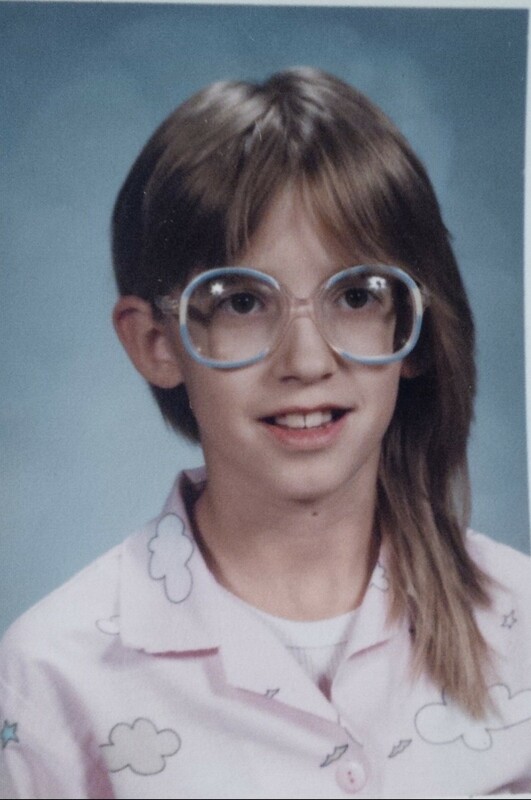 The cargo pants, Summer Camp 1986 off-the-shoulder t-shirts and mint green jump suits with large brass buttons that may have looked glamorous on a model in Seventeen magazine, but not so much on a kid with bat ears, rabbit teeth, and big blue glasses. Not that I had any clue how ridiculous I looked. My affinity for those coral cargo pants coincided with the rise of “giving shorties” as the thing to do among fifth graders at Alden Elementary and I hadn’t quite mastered the Sunday School lesson of do unto others, blah, blah, blah. I knew I was a target, but I couldn’t stop wearing the pants. They were just so cool. They had come from Minneapolis after all. My friends and I watched each others’ backs as we walked around blind corners to and from art class and on the playground where a kid in the middle of a game of tag might just short you as he went streaking to the other side. But if I really ever thought I was going to make it safely to the sixth grade, I was kidding myself. I got mine one day as my class stood single-file in the hallway on the way to library, waiting for another elementary school chain gang to come through the doors in the opposite direction. Without my scrunchie mafia around me, a boy from another fifth grade class saw the opportunity and in a flash, the coral pants were around my knees and my day-of-week pink cotton underwear was out there for world to see. My sincerest apologies for not being able to supplement this post with a photograph of the aforementioned cargo pants, but I can post this picture depicting the glory of 10 year old me in another fashion-backward garment courtesy of my mid-Western relatives. I think sweats in public are okay at 28, too. But think – Harry Potter wore glasses like those. Well, sorta like those. I think his were smaller. Haha – yeah, those glasses were enormous. And SO blue. I have no idea why my mother let me pick those out! I went through a period of time when I refused to wear jeans too!